The School of Physics and Astronomy has a strong relationship with the community including the general public, schools, teachers, industrial partners and policy makers (including the Science Advisory Board for Wales, the Government Equalities Office and research councils). We have a large outreach programme made possible by members of the School volunteering their own time. As part of this programme, we offer a range of talks on cutting edge scientific research from academics in the School and have provided support for a number of innovative resources for education and outreach purposes. We also host specific events for students aged 4-18 and help run teacher training activities. We have an active outreach group. Formally, these include Head of Public Engagement and Outreach Professor Haley Gomez, Ogden Science Lecturer and STFC Public Engagement Fellow Dr Chris North, Universe in a Classroom manager Sarah Roberts, Schools Liaison Officer Wendy Sadler and Dr Edward Gomez (Director of Education at Las Cumbres Observatory). Combined with our excellent administrative and technical staff, we run the everyday projects. We also have an Outreach Committee which oversees public engagement strategy in the School, and many members of academic staff and students who also run and engage with outreach projects on a national level. 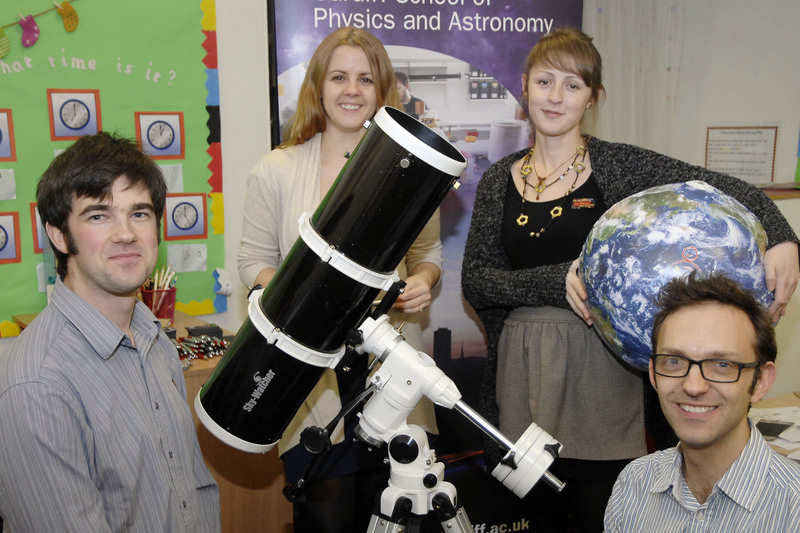 From left to right: Dr Chris North, Prof Haley Gomez, Sarah Roberts and Dr Edward Gomez, part of the public engagement team at the School of Physics and Astronomy. Thanks to St Joseph’s School who provided us with this image.